It took nearly a month, but President Donald Trump is finally operating with at least half of his Cabinet in place. Not since George Washington in 1789 has a newly elected president waited so long. Twenty-five days after Trump took the oath of office, the Senate on Monday night voted to confirm the eighth and ninth members of his Cabinet: Treasury Secretary Steven Mnuchin and Veterans Affairs Secretary David Shulkin. The six remaining Cabinet nominees will have to wait a while longer. Why? Unprecedented delays and obstructionism on the part of Democrats have resulted in the most contentious confirmation process in U.S. history, according to a Washington Post analysis. No other president’s nominees have collectively faced similar opposition. And that’s just the 15 members of Trump’s Cabinet. Other top nominees, such as Rep. Mick Mulvaney to lead the Office of Management and Budget and Scott Pruitt to head the Environmental Protection Agency, continue to wait as well. And then there’s Supreme Court nominee Neil Gorsuch, who could face the biggest battle of anyone. It’s the consequence of a polarized Washington, where Democrats are in no rush to rubber-stamp Trump’s picks, even though past presidents have been afforded such a courtesy. “President Trump has the fewest Cabinet secretaries confirmed at this point than any other incoming president since George Washington,” says Senate Majority Leader Mitch McConnell. 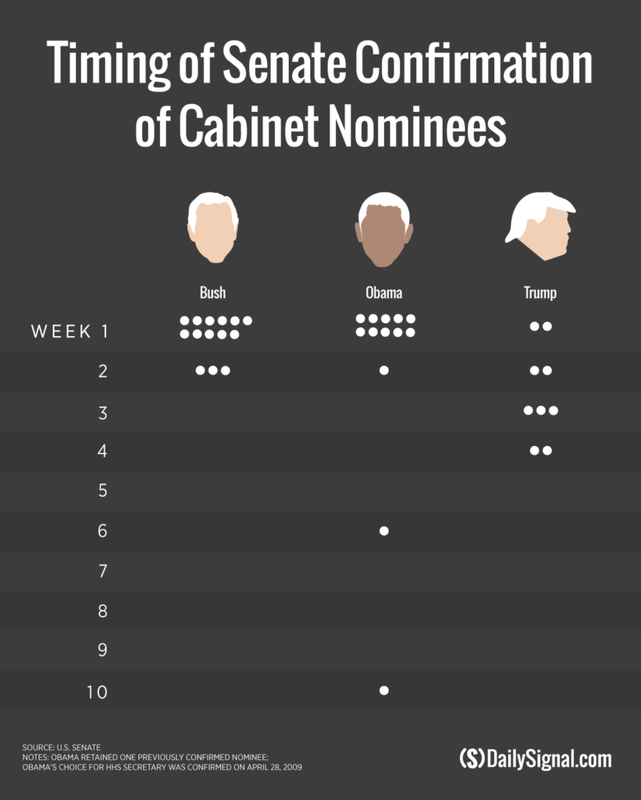 In fact, many presidents had their Cabinet nominees in place on Day One. Such was the case beginning in 1881 with President James Garfield and spanning 52 years until President Franklin D. Roosevelt. Washington, of course, was establishing the office for the first time when he was inaugurated on April 30, 1789. His Cabinet wasn’t confirmed until September 1789. Barack Obama had 12 of 15 confirmed. George W. Bush had 14 of 14 confirmed. Bill Clinton had 13 of 14 confirmed. George H.W. Bush had 10 of 14 confirmed. Ronald Reagan had 12 of 13 confirmed. Jimmy Carter had 11 of 11 confirmed. Richard Nixon had 12 of 12 confirmed. John F. Kennedy had 10 of 10 confirmed. Dwight D. Eisenhower had nine of 10 confirmed. 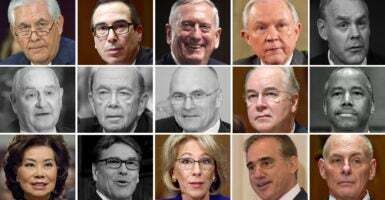 Monday’s confirmation of Mnuchin and Shulkin gives Trump nine of his 15 Cabinet secretaries. Two of Trump’s nominees—Sonny Perdue for agriculture secretary and Andrew Puzder for labor secretary—haven’t had a committee hearing yet. 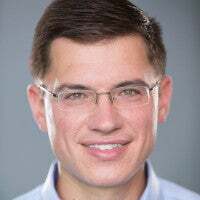 Puzder’s is scheduled for Thursday, while Perdue, picked Jan. 18, is still awaiting a date. The confirmation delays have left many agencies without a leader, a situation Democrats know is impeding Trump’s ability to implement his policies. “This is a president who wants change, and he has got to get his nominees confirmed as soon as possible if he is going to get that change,” Don Devine, director of the Office of Personnel Management under Reagan, told The Daily Signal last month. Under the leadership of Senate Minority Leader Chuck Schumer, Democrats have kept their promise to delay Trump’s nominees, even if they lack the votes ultimately to defeat them. Schumer, D-N.Y., specifically targeted eight of Trump’s picks. Five now have been confirmed: Education Secretary Betsy DeVos, Health and Human Services Secretary Tom Price, Attorney General Jeff Sessions, Secretary of State Rex Tillerson, and Mnuchin. The other three targeted are Mulvaney, Pruitt, and Puzder. Trump has also voiced frustration with the slow progress. And while the Senate slowly confirms his Cabinet, the time it spends to do so prevents lawmakers from addressing the president’s legislative priorities. Last week, for instance, senators had to wait 30 hours between votes because of Democrat delaying tactics. The Senate confirmed three nominees—DeVos, Sessions, and Price—over the span of a week. Even those who won Senate confirmation faced “record-setting opposition,” according to The New York Times. Another delaying tactic Democrats have employed is boycotting the nominees’ committee votes to deny a quorum. 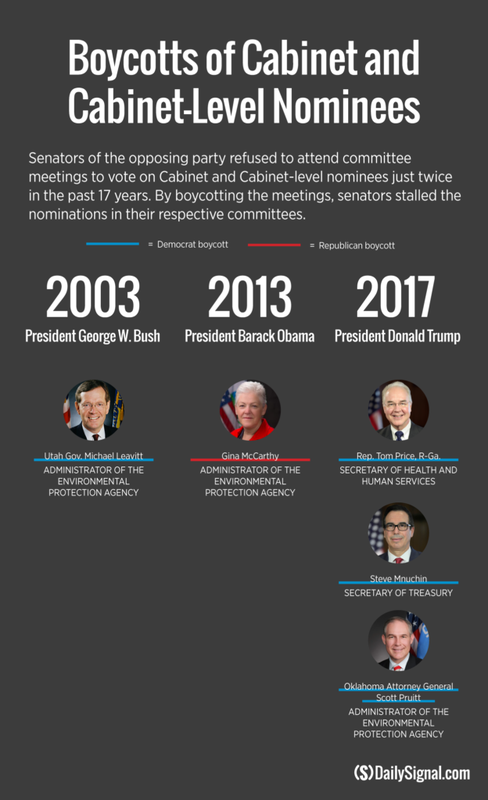 Three of Trump’s nominees have faced this treatment—unprecedented for a newly elected president. Obama and Bush nominees faced similar boycotts, but not until later in their presidencies. In 2009, Obama had 10 Cabinet secretaries confirmed after his first week in office. 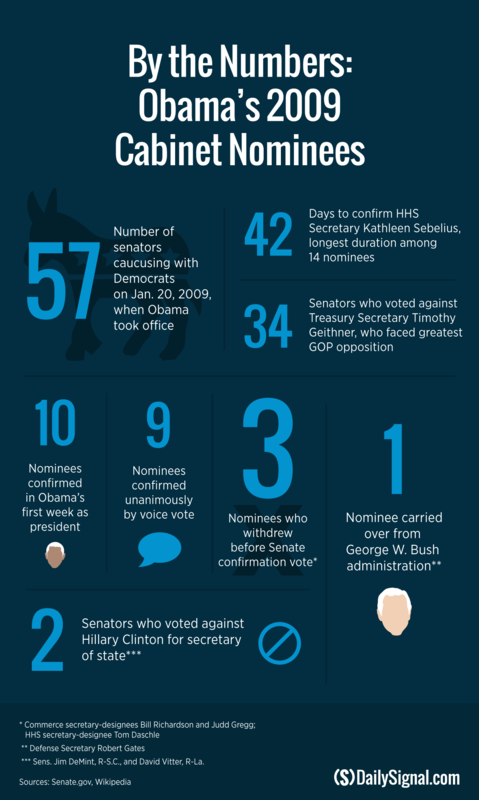 Nine of those nominees won Senate confirmation by voice vote, where an official tally isn’t recorded. The Obama nominee who faced the greatest GOP opposition—Timothy Geithner for treasury secretary—was approved 60-34 on Jan. 26, 2009, less than a week after Obama took office. Like Trump, Obama enjoyed a Senate controlled by his own party. Democrats had 57 senators on Jan. 20, 2009, when Obama took office. Today, Republicans have 52 senators. Photo: Trump’s picks include (from top left) Rex Tillerson (Photo: Ron Sachs/ZUMA Press/Newscom); Steven Mnuchin (Photo: Ron Sachs/ZUMA Press/Newscom); James Mattis (Photo: Kevin Dietsch/UPI/Newscom); Jeff Sessions (Photo: Ron Sachs/ZUMA Press/Newscom); Ryan Zinke (Photo: Carlos Barria/Reuters/Newscom); Sonny Perdue (Photo: Albin Lohr-Jones/ZUMA Press/Newscom); Wilbur Ross (Photo: Mike Theiler/UPI/Newscom); Andrew Puzder (Photo: Ron Sachs/CNP/Newscom); Tom Price (Photo: Ron Sachs/DPA/Newscom); Ben Carson (Photo: Kevin Lamarque/Reuters/Newscom); Elaine Chao (Photo: Ron Sachs/ZUMA Press/Newscom); Rick Perry (Photo: Mark Reinstein/ZUMA Press/Newscom); Betsy DeVos (Photo: Ron Sachs/DPA/Newscom); David Shulkin (Photo: Veterans Health Administration/Flickr); and John Kelly (Photo: Ron Sachs/CNP/Newscom).